The king of the kitchen, cast-iron cookware gives you crispy fried food, a succulent sear on your steak, and a quick cleanup after cooking—as long as you season your pan correctly. Fortunately, these four steps make the process really easy. Cast iron, properly cared for, can last a lifetime at least in the kitchen. 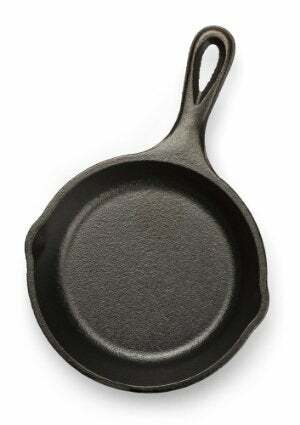 Apart from cleaning your pan or skillet after each use, seasoning cast iron ranks as the most important step you can take toward maintaining this type of cookware. Seasoning is a simple process that leaves a natural nonstick coating, one that makes cooking with cast iron not only more enjoyable, but also much more convenient. How do you season cast iron? Continue reading to learn the steps involved! To get started, preheat the oven to 350 degrees Fahrenheit before washing the cast iron thoroughly. Use a combination of warm water and dish soap to eliminate any residue that’s built up over time. Once done, rinse with water and dry the pan or skillet with a soft cloth. In the future, remember not to use dish soap when cleaning your cast iron, as the soap diminishes the effect of seasoning. 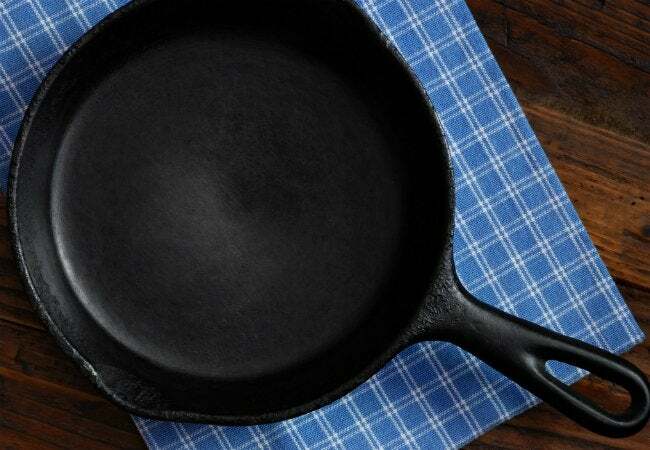 After use, simply rinse the cast iron with water and wipe it down with a kitchen cloth. Next, choose an oil to use in your seasoning. Some experts say that refined flaxseed oil does the best job. It’s far from being the cheapest option, though. Crisco or lard work well, but really any vegetable oil will do, so long as its smoke point—the temperature at which it starts to smoke—is above your normal cooking temperature. Above all, make certain not to use any oil that boasts a strong flavor. Pour in the oil of your choice, spreading it around to evenly coat the pan or skillet. For best results, rub in your chosen oil with either a cloth or paper towel. Cover every square inch of the cooking surface. Place the cast iron, upside down, into the preheated oven, resting it on the oven rack with a piece of aluminum foil beneath it. The goal here is for the pan or skillet to heat until the oil has reached its smoke point. Then and only then is there a chemical reaction that results in the desired nonstick coating. Different oils have different smoke points. To bring flaxseed oil to its smoke point, turn your oven up to its maximum heat seating. If you’re using vegetable oil, keep it at 350 degrees. Bake the cast iron for about an hour, then turn off the heat and allow the metal to fully cool before removing it. Eventually, the cast iron will need to be seasoned again. To put that off for as long as possible, remember not to use dish soap when cleaning the cookware. Simply rinse it off with water, wiping it down with a soft cloth, not a scourging pad. Add a little salt for scrubbing power, if necessary. When the cast iron surface becomes dull and sticky, you’ll know that the time to season has come again.